This is a follow up to my October posts (here and here) concerning Rankin County's Mississippi Blues Trail markers. Now you have an easy way to help fund these markers by displaying your love for Mississippi music. 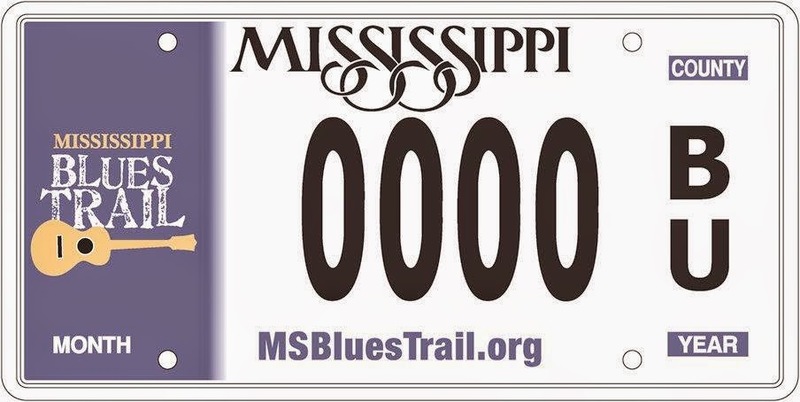 Order a Mississippi Blues Trail license plate from your local tax collector’s office. Benevolent Fund: Helps Mississippi blues artists in times of need. Blues Trail Marker Fund: Helps communities pay for markers, along with maintenance and/or repair. 1. Go in person to your local tax collector to place your order. The best time is when you renew. 2. Pay the annual fee of $33.50. 3. Your tag will arrive in the mail in 4-7 days. I love the work the Blues Trails have done.